Union Budget 2016-17 was announced by finance minister Arun Jaitley today. This is third budget of BJP government under leadership of PM Narendra Modi. It was challenging for finance minister to make budget for 2016-17, however he has tried his level best in making budget 2016-17. Overall Union Budget seems to be OK. Lot of new announcements were made by finance minister in budget 2016-17. Let’s take a look Key Highlights of Union Budget 2016-17. No change in Tax Slabs. However relief to small tax payer with income up to 5 lakh in form of rebate u/s 87A. Limit enhanced to Rs.5,000. Deduction u/s 80GG for rent paid is increased to Rs 60,000 per annum from Rs 24,000. Withdrawal up to 40% from NPS Tax free. Similar exemption for EPF and Superannuation Funds. The Government will pay EPF contribution of 8.33% for all new employee for first three years. New Health Insurance scheme for lower class up to 1 Lac. Cost of medicine will be borne by government. PM Jan Aushadhi Yojana to be reinforced by opening new 3000 medical stores. Basic dialysis equipment will get cost benefit. Selected Education Institute to be made world-class. Digitalization of all school leaving certificate. Training about Entrepreneurship to be provided across school, colleges. Providing skill to 1 Cr youth in next 3 years under PM Kaushal Vikas Yojana. 100% deduction will be available on Income from startups for 3 years. Capital Gains will not be taxable for investment in startup. Company Act Amendment to improve enabling environment for startup. Small shops will be given choice to open on all 7 days. Promise to double the income of farmer in next five years. Insurance scheme for former to insure agriculture crop. Low premium and high compensation in case of crop loss under new PM Fasal Bima Yojana. Allocation of fund for organic farming. Recapitalization of public sector banks will be done. Government will increase ATM and Micro ATM for Post office. Additional 0.5% Krishi Kalyan Cess to be levied on all services. 5 % cess on diesel cars of certain specifications; 4 per cent on higher-end models. For NRI new document will be introduced apart from PAN card. Use of E-Assessment for all assessees in 7 mega cities. Certain announcements made by finance minister were very good like introduction of health protection scheme, allowing shops to be open for 7 days, EPF contribution for new employee etc. However steps like introduction of additional cess and taxes will increase inflation level. Over all Union Budget 2016-17 was another average budget presented by finance minister. 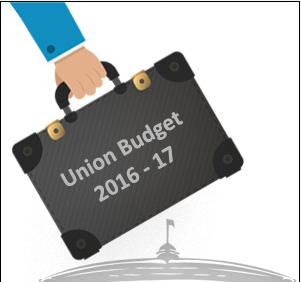 What is your take on Union Budget 2016-17? Do voice your opinion in comment section.